DURHAM – Learn about the work of the North Carolina Coastal Federation Dec. 15 while slurping oysters and sipping beer at Eastcut Sandwich Bar. 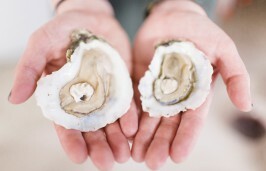 Eastcut Sandwich Bar, Ponysaurus Brewing and the federation, which publishes Coastal Review Online, are bringing the oyster, beer and oyster adoption party to the Triangle for the event, Oysters + Oyster Saison + NC Coast + Live Music. Eastcut will be serving fresh oysters from 2 to 10 p.m. or until they run out, paired with Ponysaurus Brewing oyster saison beer. $1 from every pint of the oyster saison will be donated to the federation. There will also be live music provided by the Nash Street Ramblers from 4 to 7 p.m.
Bodie will be at the event to help attendees register for the Adopt-an-Oyster program that benefits the federation’s 50 Million Oyster Initiative. New “parents” will be able to follow their oysters’ growth on the North Carolina coast. 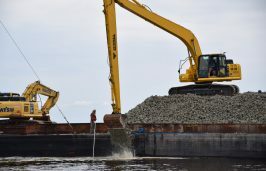 The 50 Million Oyster Initiative is a three-year campaign to restore 50 million oysters to North Carolina waters in order to improve water quality, provide habitat for important marine life and improve local economies and tourism. Contact Bodie at kellyb@nccoast.org for more details.